Whether you're looking for a cozy travel trailer or a big, luxurious 5th wheel, you'll want to see us at RV World MI for your dream RV at a price that will astound you! Although we're headquartered in the beautiful and growing community of Grand Rapids, Michigan, our fast, reliable worldwide delivery service has won us customers everywhere! 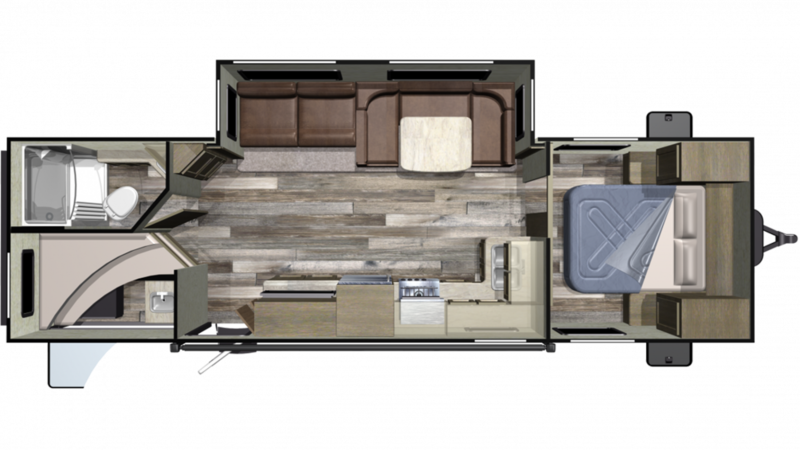 That's because we can save you $1000s on this 2019 Starcraft Autumn Ridge Outfitter 282BH Travel Trailer! So come in and see us today at 7834 S Division Grand Rapids Michigan 49548 or go online and give us a call at 616-591-3632! Our friendly, knowledgeable staff offer personalized service to every customer, and we can tailor a deal just for you! You'll drive away happy in your dream RV, we guarantee! With a 595 lbs. and a GVWR of 8500 lbs, this RV is ready to tow and go! The 20' 0" patio awning provides shade and comfort when you're relaxing outdoors! Make a home-cooked meal instead of going out to eat fast food! Inside the kitchen you'll find a 6.00 cu. ft. refrigerator, a 3 burner range cooktop, and more! The sink pours plenty of fresh water to clean, drink, and cook with, thanks to the 48 gallon fresh water tank! Do you like to trudge through the campground just to use the shower or the bathroom in the cold, damp, and often messy community bathroom facility? Who does? Thankfully, you'll never have to endure that ordeal again, thanks to the bathroom with its modern shower and handy Foot Flush toilet! There are 60 lbs. of LP tank capacity, so the water stays hot for longer periods of time! The 64 gallon gray water tank and the 32 gallon black water tank stores all the used water and waste discreetly! There's plenty of comfortable places to sleep inside this RV, thanks to the cozy Bunkbeds in the bunkhouse! The outdoor kitchen allows you to make delicious meals and enjoy your favorite cold drinks under the sun!